rotimatic review – a sponsored review of automatic roti maker machine with photos and video. the good news is, it is not just a review post! in fact you can order your next rotimatic directly from our website in a special discounted price. more good news! if you place your order via hebbar’s kitchen, you would be served on priority by skipping the long queue with no wait time. isn’t it a good deal for your next roti making robot? 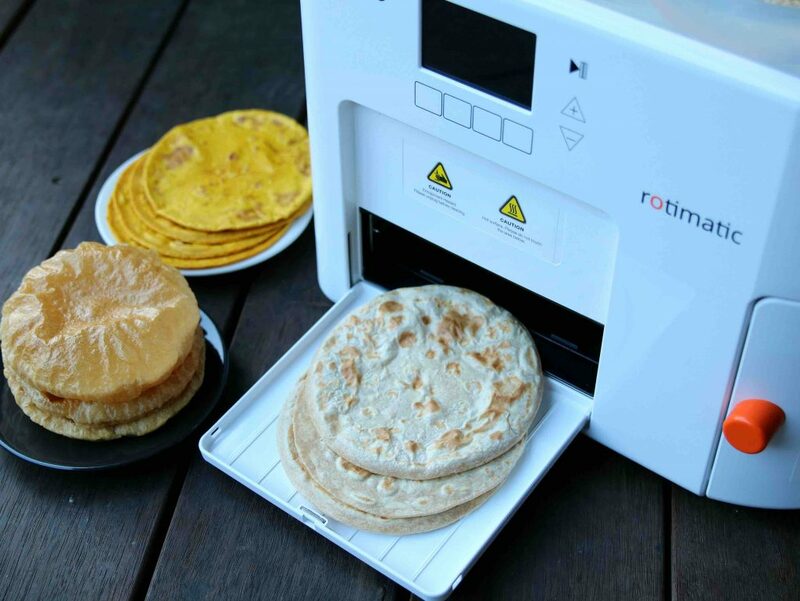 rotimatic is the world’s first robotic kitchen appliance which prints garama garam roti’s. basically a smart device that measures, kneads, prepares dough, flattens the roti’s, cooks and puffs the rotis in just 90 seconds. yes you heard it right, in just 90 seconds. All you need to do is to fill it with the flour, water and oil to its corresponding containers. and then set your preferences like roast level, thickness of roti and the most important one – number of roti’s. the next big task is to hit the play button and confirm that you want to make roti. so what is this rotimatic and how does it works? once the start button is pushed the machine would start preparing the dough by dispensing wheat flour, water and oil. it automatically calculates the quantity of each ingredient to prepare a soft dough. it comes with inbuilt press to roll the roti’s to a desired thickness. finally the roti’s are cooked and puffed with its inbuilt griddle before pushing it out from its outlet. the entire step is repeated for the next roti and the roti’s are delivered sequentially. having said that it does multi tasking too! so when the first roti’s are pressed in its pressing container, the dough making container starts with the second roti. so technically the subsequent roti’s should take around 60-70 seconds compared to the first one of 90 seconds. how does roti’s taste? are the rotis soft? certainly the roti’s are amazingly soft. the fact that you can control the thickness and roast level of roti make’s it perfect roti machine and can meet any individual preference. the roti’s would have crisp outer layer and more doughy inner layer. also the roti’s would be cooked perfectly and evenly without any uncooked portion. i personally liked the consistency part of the rotimatic. i tried with the 2 different brands of wheat flour and each roti in a batch looks identical to one another. it supports multiple brands of wheat flour and works with whole wheat and multigrain flour / atta. how many rotis for a small family? the best part of rotimatic is the selection of number of roti’s before starting the machine. the machine can take a input of 1-20 roti’s in a single batch. but you may have to refill the wheat flour and water after 13-14 rotis. the machine would notify in its screen to top up the respective ingredients if it is running low with wheat flour, water or oil. in short, for a family of 2-3, you may require 11-13 rotis based on individual appetite. what else rotimatic can do? i guess most of them would be under impression that rotimatic is just for roti’s. or you may think should we buy a bot just for roti’s? well the answer is rotimatic is not just for roti’s. it prepared masala roti, palak roti, tortilla, pizza and even poori’s. but the poori’s has to be deep fried separately as it would deliver only poori disk. i was skeptical with the poori, but i was delightfully surprised with the outcome of poori. how easy is the cleaning? thank god, cleaning is very easy with rotimatic machine! you do not have to clean the entire machine on a daily basis. i only clean 2 small transparent parts on a daily basis after each use. basically these 2 parts are used for dough making and can be accessed via side door of machine. it can be easily brushed and rotimatic comes with these custom brushes. alternatively you can use dishwasher too. the reason i clean it daily because it may have traces of wet dough and if not cleaned may block the machine movement. whereas the container for wheat, water and oil can be cleaned once in a week. again it is dishwasher safe. is it really a worth investing? it is definitely a big investment but i personally feel romatic’s versatility is well worth the price. It saves time and after all, time is money. currently it is priced as $999 USD, however if you order via hebbar’s kitchen you would receive a flat 7.5% discount with no waiting and priority order. let me also explain why buying rotimatic is a good investment. let’s assume, if you are depending on frozen rotis; in this case you would be not only spending fortunes but also end up having preservatives coated rotis on daily basis. secondly, if you are working couple, then you will be saving a minimum of 30 minutes of your daily chores. 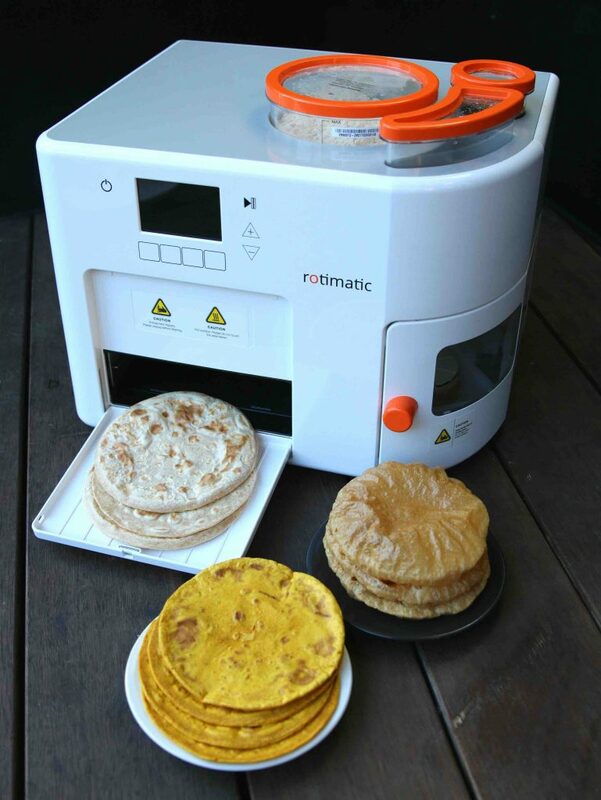 lastly, rotimatic is not just for rotis, it also makes poori, tortilla, pizza and masala rotis. rotimatic is best for those who are not good in making rotis or who do not have time but still miss eating healthy. it makes your life easy as even a kid can operate the machine. in short, the rotis taste a lot better when compared to frozen rotis or pre-packed chapthi / roti. period! rotimatic is a great product. It is versatile, it saves time and starts paying for itself in just six months. It also gets smarter with time and learns from what you feed it (ingredients). it is ideal for those who are not good in making rotis or do not prefer to prepare because of lack of time / lifestyle. rotis are anytime better than frozen rotis. anyone can prepare homemade and fresh rotis with a single touch. i would certainly recommend this product. do let me know your experience with rotimatic and feel free to drop any queries in below comment section. also do not forget to place your order via our priority link. note: this is a sponsored post from zimplistic pte. ltd. and the opinion shared about this product is through my personal experience with it. Is this available in india?If not..any idea when it will? I just got myRotimatic :-). Can you please post recipes like masala roti etc. using this? Or if you have already posted recipes, please share the link to it. Thank you! sure will share more recipes.. I Would like to buy 1piece of Hebbar Automatic Roti maker. Please let me know the price in Indian rupees & if it’s available in Chennai Tamil Nadu. India. they will launch soon there..
Its about 61k in indian rupees..
Can we get this in india? Hi, Is this available in India & what will be the price. not yet..they will launch soon there..
hi, i would like to know the price of the maker, thank you. when it will come in India ? soon they will launch there..
soon they will launch in india..
Can i make the roti without oil . Is it available in India or not? is this available in India? if yes.. what price ? What is the price in india currency?? what is the cost of this machine ? pls late me know . Right now offers available only in US, Singapore, UK, Australia, New Zealand and Canada. What about uae ?and what is the pric in dh ? Its actual price is 999$ and thru your discounted url , its also displaying as 999$ per unit. And all other options are already available there like price reduced when buying more than 2. I don’t see what discount you are providing then ?? Is this available in India? If yes, what is the price? Hi, great video of the Rotimatic preview! I would like to know how to make tortilla, palak roti and masala roti. Could you post a video of the same? your links to order Rotimatic doe not open at all ,how to order ?? ?